Looking for a recommendation from an insider in the Lexington food and drink scene? Lexington’s own Jonathan Searle, Executive Chef at acclaimed 21c restaurant, Lockbox, shares a few of his favorite spots with us. Lexington is a truly special combination of Horse Country, Bourbon Country and genuine Southern hospitality. Jonathan Searle began his culinary career in 2008 at Lexington restaurant staples Dudley’s on Short, Bourbon n’ Toulouse, and Bellini’s. He then joined acclaimed restaurant Proof on Main at Louisville’s 21c hotel, rising through the ranks to become Executive Sous Chef. 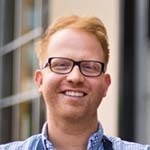 Searle helped the restaurant earn numerous accolades including a place on Bon Appetit magazine’s list of “10 Best Hotels for Food Lovers.” With a successful tenure at Proof and a strong network of the region’s craft purveyors, Searle returns to Lexington as the Executive Chef of Lockbox. His menus feature simple ingredients and nod to Kentucky’s rich Southern heritage and Lexington’s unique cultural identity. Your guide to Southern flavors with unique Kentucky flair.